Strolling through an Italian diocesan museum or an exhibition on the art of the Italian Renaissance, a visitor will inevitably encounter many images of saints, alone or in groups, presenting themselves and their attributes to viewers inside and outside the picture within which they are framed. 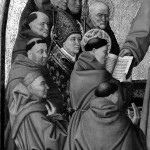 After a while, any reasonably observant viewer will notice that there is one face that stands out from the crowd of painted saints: that of Saint Bernardino of Siena, the Franciscan preacher and vicar general who died in 1444 and was canonized only six years later. One of the innumerable examples of this uniquely recognizable face is Antonio Colantonio’s Saint Francis Giving the Rule to His Disciples in the Museo di Capodimonte in Naples (fig. 1). 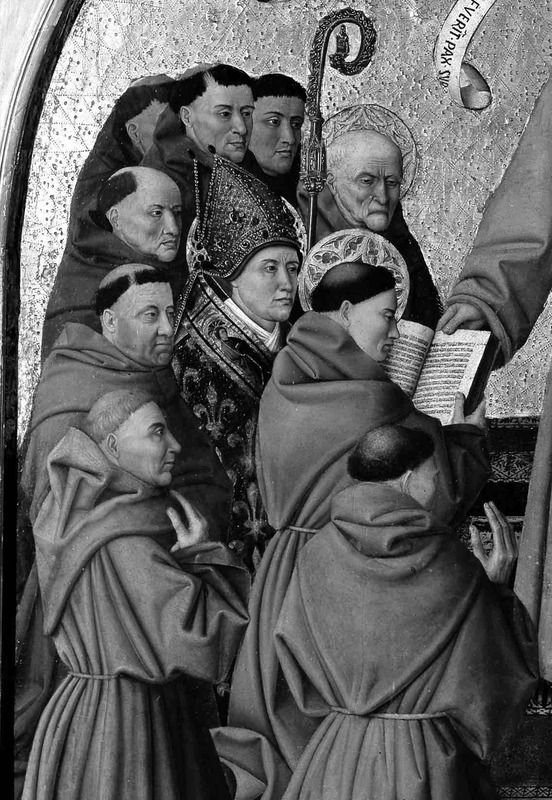 In the group of men on the left, the saints have been given individual faces by the careful artist. 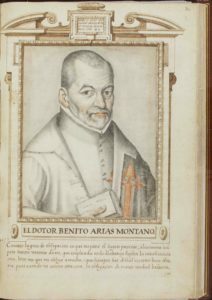 But Bernardino’s face seems markedly different; it seems to stem from our own world, whereas the individualization of the neighboring saints reminds us more of faces in the medieval sample books used in workshops. The beholder’s gaze is compelled by Bernardino’s authentic, emaciated, recognizable features, which are in stark contrast to the other saints’ obviously fictive faces. This article focuses on the development of portrait busts of saints beginning in the early Renaissance. The category of the portrait bust, which emerged slightly before 1440, is characterized by its reference to—and at times even integration of—the death mask of the recently deceased saint. As such, these images must be seen in close relation to traditional head and bust reliquaries. The particular group of busts showing the features of the Florentine archbishop Antonino Pierozzi is here analyzed through hitherto obscure written sources, and the proliferation of Pierozzi’s bust is then related to that of other saints. URTE KRASS works as Assistant Professor at the Institute for Art History of the Ludwig-Maximilians-University, Munich. Her research focuses on saints’ images from icon to photography, on early artistic theory in the Italian novelle of the fourteenth century, and, more recently, on the political use of images in Portugal and its overseas empire in the early modern period.